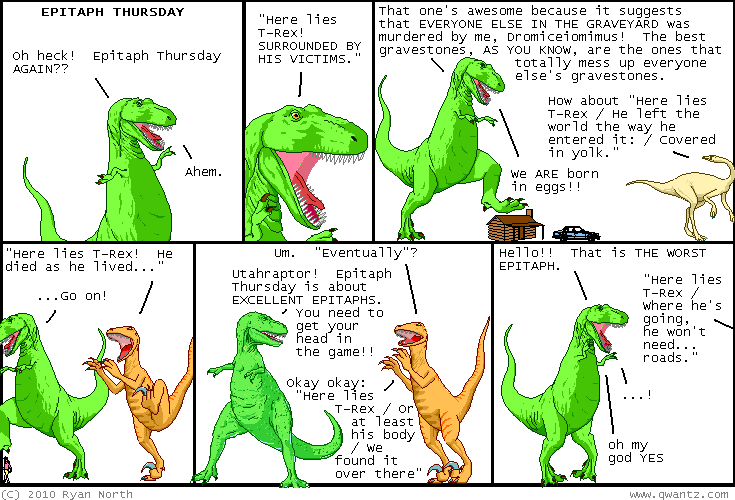 Dinosaur Comics - May 6th, 2010 - awesome fun times! May 6th, 2010: This comic comes out of the same marathon post-ROFLcon epitaph-session with messrs Straub, Malki, Weiner, Munroe, Comeau and Mlle. Horne. You may be seeing a lot of graveyards in our comics, it is because we all ate a meal together and then talked about death. NEWS! I'm going to be at the Toronto Comics Arts Festival this weekend at the Reference Library, right downtown! This is an awesome show - tons of comics, and it's free to get in too! You should TOTALLY COME OUT if you can. I'll be there along with so many other awesome cartoonists, many of whom are living in my house AS WE SPEAK. (Actually only Joey Comeau and Emily Horne and Kate Beaton are living in my house AS WE SPEAK but that's still pretty good). I'm on two panels: one's Saturday at 3:30 called "Tracers, Photoshoppers, Cut & Pasters: Cheaters or Revolutionaries" and one's Sunday at 2:15 and is called "The New Graphic Novelists: New Creators Transforming the Medium". I will be talkin' about COMICS I guess! !